Save a high cost of repairs in the future and give your property a bright and clean appearance with the professional exterior painting services of Real Painters in Hammersmith and Fulham. 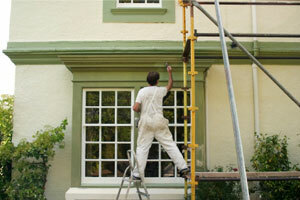 We will not only paint your exterior walls the way you wish but also add the needed protection to your home. Choose an option from our range of exterior painting services to ensure your home stands out from the rest. All you have to do is dial 020 3026 9530 or complete the online contact form on our website. Booking our painting staff, you will enjoy an immaculate service performance by courteous and responsive individuals. No matter whether you need to paint the exterior walls of your house, garden furniture, deck, drainpipes or any other area, Real Painters in Hammersmith and Fulham will be happy to do it for you with utmost care and meticulous attention to detail. Our professional painters will give your exterior surfaces a completely new look and add value to your property. The professional painters of Real Painters work from Monday to Friday (from 8 am to 7 pm) and can be booked for the suitable time for you. To schedule a site visit from them, please call 020 3026 9530 to contact our friendly advisers.